The DS and its various and sundry iterations have spawned some mechanically interesting titles as the years have gone on, and while plenty of also-ran “me too”Â garbage has found its way to the console, so too have some rather interesting experiences. Anyone who has played The World Ends With You, Trauma Center, Lifesigns: Surgical Unit and Konductra probably has a pretty good idea where I’m coming from here. The DS, for all of the stigmas attached to it about it being for kids or it being a gimmick, has surpassed all of the naysayers and produced some interesting and unique products, games that would not otherwise have been able to come out for another console, entirely because some creative people took the mechanics of the console and crafted something completely weird and interesting with them. The 3DS, by comparison, has largely been seeing rehashed concepts dumped out onto its dual screens, with developers porting over older games or releasing products that don’t make worthwhile use of the equipment in hopes of impressing people with the 3D tech and little else, and while this is common for a new console, it’s no less disheartening. Well, Dream Trigger 3D is, in many respects, an answer to those looking for some sort of innovation for Nintendo’s newest handheld, as it takes elements from rhythm games and shooters and combines them with the unique mechanics offered by the 3DS in an attempt to make an interesting and innovative experience. Make no mistake, this is a heavily ambitious title in a lot of respects, though whether or not it manages to pay off on those ambitions will likely depend on whether or not the player can safely adjust to what the game does, as for all of its innovation, the game isn’t without its flaws. There’s not really a story, as such, in Dream Trigger 3D, but it has a few different play modes to work with so as to keep you interested. World Map Mode is basically a campaign of sorts, testing you to go through a massive map of different zones to shoot down enemies and earn points as you go. Free Play Mode is exactly what you’d think, allowing you to go through any one of the different fields you’ve unlocked to earn a better score in it. Time Attack Mode is similar to Free Play Mode, only it grades you on time taken to beat a field instead of the score you earned playing through it. Versus Mode allows you to play against other players who have their own copy of the game to see who is the best, though it doesn’t support any sort of online option, nor does it seem to have any sort of download play option available. You can also screw around in the Options menu to adjust various settings, check out your records independent of the main game modes, look over the list of challenges you can complete to see what you have done and what you have left to do (though many are hidden), view the tutorial for the game after it’s offered the first time, and delete your save data in case you, I don’t know, want to unlock everything again or something. As such, there’s enough to do to keep the game interesting and the game does offer a few nice extras for keeping track of your progress, and while there’s nothing off the wall or unique on display here, what is offered is functional and enjoyable. The visual style of Dream Trigger 3D is highly stylish, mixing abstract imagery and visual elements with various mystical, science-fiction and nature-inspired elements to create a bright, colorful, engaging game world that’s interesting and beautiful. The game isn’t really pushing the visual capabilities of the 3DS so to say, as many of the enemies you face aren’t especially well animated, nor is your targeting device, but this hardly matters. The stylish and slick elements, from the stark main menu to the crazy and vibrant fields you battle in are all incredibly well executed and great to look at, and the game is beautiful not because of what it does with the technology but because of the effort put into the style by the developers. The audio is mostly upbeat, ambient electronic music that fades in and out as you do various things in the fields, not unlike Rez, and it’s both fitting and enjoyable to listen to. The sound effects mostly consist of futuristic sounding noises when various things are shooting and blowing up and such, and they’re fitting to the experience and sound fine all in all. Overall, the presentation comes across in equal parts like traditional shooters, Rez and Tempest, oddly enough, and by and large, it works. 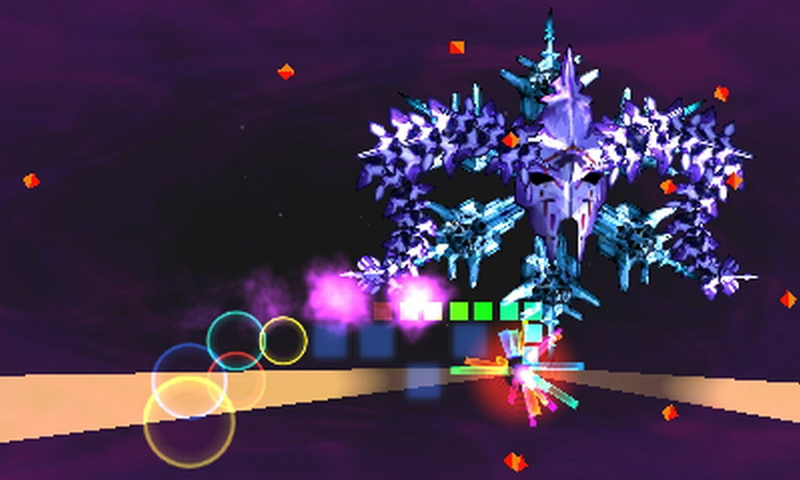 Dream Trigger 3D shows most of its innovation in its play style, however, as it’s fairly unique in its mechanical design. In essence, the top screen shows the game world itself, along with your little space ship sort of thing, while the bottom screen is a gray and white void. You move your ship around the top screen with the analog stick and fire your lasers with the left or right bumper, which is simple enough. The catch is that enemies spawn into the game world invisible, slowly generating white energy blobs on themselves as they move around just before they fire bullets into the game world, which you’ll have to dodge. To damage them you’ll have to make them visible, which is done with the bottom touch screen. See, you can see the enemies on the bottom screen as, by default, purple shapes, which allows you to know where they are relative to your ship whether they’re firing or not. You’re given what the game calls Sonar Pings to make the enemies visible, of which you can use up to sixteen at a time. By drawing across the bottom screen, you’ll plant sonar pings on the screen, ideally somewhere near the enemies on the screen. Routinely, a rhythm bar will cross the screen, setting off the sonar pings and, in turn, making any enemies nearby visible, and thus vulnerable to your shots. You’ll then be able to blast them out of existence, so long as you have power to do so. 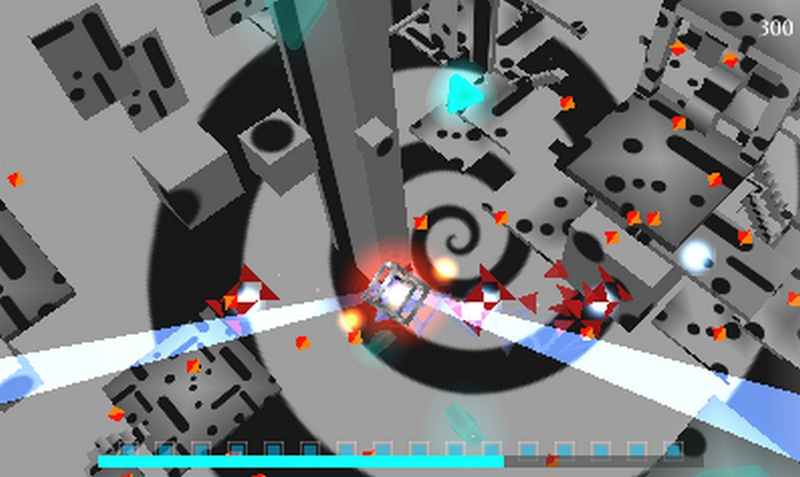 Your shot bar has a limited amount of energy, which is depleted by shooting, obviously, and is refilled by setting off pings near enemies to reveal them, making this sort of a back and forth battle to ensure you have enough energy to shoot by revealing lots of enemies and shooting as little as possible to destroy the most enemies. Shooting also leaves you invincible while doing so, making it useful as a way to avoid bullets, so you can use it in emergency cases to avoid damage if you must, making this a very risk/reward oriented experience. 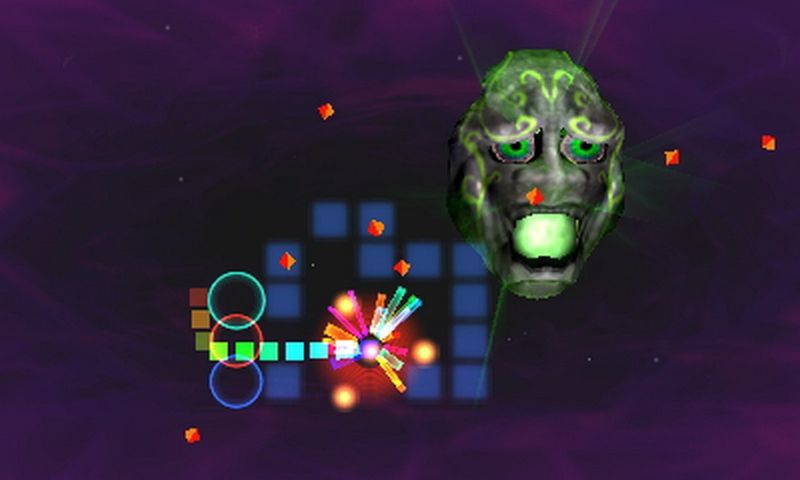 Your ship has a total of four hit points to start with, represented by four yellow glowing balls on and around the ship itself. Each time you take damage, one of the balls disappears, and if all of them goes away, it’s game over, try again. On the flip side, however, there are also various power-ups to collect that can, among other things, increase your score, add a ball to your health, give you infinite shot meter for a period of time, build a shield around your ship, and so on, so you’re not completely without options to help you survive. You’ll need them, too, as the enemies are very populous and have no problem whatsoever with filling the screen with bullets, all meant to make you very dead in a hurry. After clearing out a series of enemies, a boss will show up for you to take out, which generally involves pinging it until its life bar shatters and it turns black, allowing you to shoot it and deplete the bar. Said boss will also shoot at you and spawn enemies, of course, so you’ll have to avoid all of that while trying to take it out. 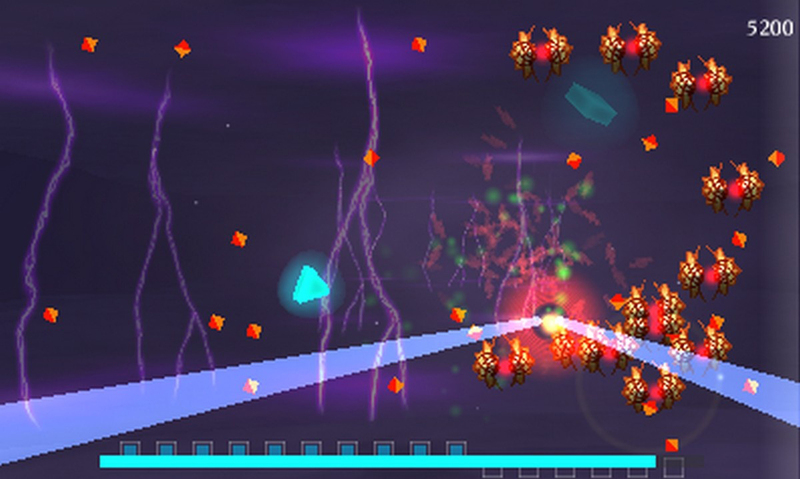 Though this is more or less the pattern for the game, make no mistake, the game gets challenging as it goes, as you’re tasked to avoid bullets like a madman while shooting anything that moves in later stages, and while it’s not quite the same experience as the games this description comes from, “bullet hell”Â definitely applies in some cases. You’ll spend most of your beginning hours with the game in World Map Mode, as this unlocks all of the fields you can use in other modes. You’ll be awarded Dream Points for each course you complete which allow you to move around the world map, moving to new locations and filling the inhabitants full of electric death until you unlock and clear everything, which is done partially by clearing stages and partly by clearing Challenges of various sorts. After unlocking stages, you can in turn revisit them in Free Play or Time Attack Mode to improve your score or rank the best time you possibly can for your own personal amusement, as the case allows. Versus Mode also allows you to take it to a friend to try and earn the best possible score, with the added caveat that you can also uncover your friends with sonar pings and, as it happens, shoot them for mucho bonus points, just for fun. As such, whether alone or with friends, Dream Trigger 3D has a solid amount of long term value to it, between unlocking fields and ranking your scores on them, and it’s pretty fun once you get used to the experience. The biggest criticism against the game, however, is that for all of its innovation and novelty, the game is kind of hard to adjust to if you’re not exceptionally coordinated. You’ll be using both screens simultaneously to find and identify enemies, and while blindly stabbing at them works okay in earlier levels, it’ll take a few deaths to get used to the mechanics and some practice to get used to the game well enough to take on the later stages. The game is by no means badly designed, don’t misunderstand, but it’s fairly complex to get the hang of at first, and you’ll be at it for a while to really get the specifics down. Further, while it’s a very interesting game, it’s not an especially in-depth one, as it lacks any sort of online component, leaderboards, StreetPass support, or anything else to make it more interesting once the main game loses its luster. The pseudo-Achievements are nice enough, and the inclusion of multiplayer is fine, but most of the game is single player stuff that you can’t really compete with anyone on and there’s no added elements to make the game worthwhile unless you’re a big fan of high scores. 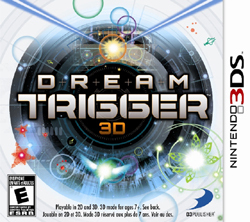 Dream Trigger 3D is ultimately a fine addition to the 3DS library, and while it’s not as friendly or robust as it could have been, this doesn’t diminish its quality much at all, as it’s a fun, entertaining and original shooter that’s worth checking out, especially if you’re finding the 3DS library somewhat lacking at this point. There’s enough to do with the game all in all, and the game generally looks and sounds great. The 3D effects are handled well, the gameplay is very interesting and unique in a lot of respects and makes great use of the hardware all around, and there’s enough content to make the game fun for those who have friends to pick the game up or have an interest in earning the best high scores around. 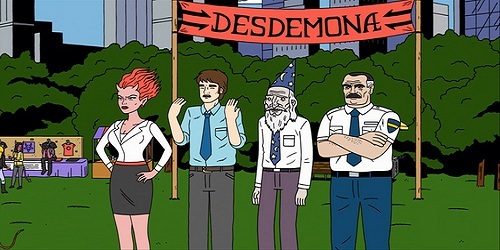 The game is significantly complex to play, however, and can be cumbersome to adjust to at first, and the game doesn’t have a lot of the more obvious options, such as online play or leaderboard support, that would have justified the full price of the game more than what’s on offer. Dream Trigger 3D still makes a solid argument for ownership based on its own merits, however, as it’s a fun and interesting game with enough solid and unique concepts to make it worth a look, and while it might not be for everyone, anyone who can appreciate what it does will find it to be one of the best games available for the 3DS at this point. Dream Trigger 3D is an ambitious title, both conceptually and mechanically, that makes good use of the 3DS technology all the way around, and while it’s not without flaw, it’s worth checking out all the same. There’s a solid amount of modes of play available to fool around with, the game looks and sounds great in all respects, and the 3D tech on display is fun and mostly well implemented. The gameplay is rather involved and makes good use of the 3DS, asking the player to use the analog stick, touch screen, and dual screens simultaneously to succeed, and there’s enough content to the game all in all to make it fun and interesting for a while. However, the game takes some notable amount of time to get used to, mechanically, as the controls are somewhat complex to really understand and succeed with, and there’s not as much to the game as one would hope, as things like online functionality and StreetPass aren’t implemented in any notable fashion. Dream Trigger 3D is still able to rise above these flaws, however, and deliver an experience that’s enjoyable and well executed, and while it might not provide a full experience for those who aren’t interested in spending time improving their scores, it’s fun enough to be worth a look and well implemented enough that it might justify the asking price even so.